Don’t struggle under the weight – here’s how to choose the best gear for your back. Does your backpack really have your back? Here are some helpful tips to help you adjust your favourite pack, and some nifty features to look out for if you’re in the market for a new one. According to the Australian Physiotherapists Association, backpacks for growing bodies should never exceed 10% of the child’s weight. Many schools are moving towards more ergonomic packs for their students, but it’s also important that these newer packs are adjusted and packed properly. Straps should be adjusted so that the pack sits comfortably along the back, with the heaviest items packed closest to the spine. They should never be slung low, below the waist or touching the backside as the extra leverage can cause unnecessary stress on the spine. It’s also worthwhile encouraging kids to pack for the day, so they reduce the load they’re carrying around all day. Although many work-related packs seem to focus primarily on style, there are still some important features to look out for to ensure comfortable day-to-day carrying. Laptops will generally be the heaviest item in your pack. So make sure the laptop compartment is near the back of the pack. As a general principle, your heaviest item should sit closest to your spine to minimise swaying. If you carry your gear around your workplace, consider a backpack that features a sternum strap. These straps are helpful in stabilising the load and preventing your straps from sliding off your shoulders. Ladies, be sure to check there’s enough vertical adjustability to work around your chest area. Long climbs, uneven terrain, sketchy descents – these are all unforgiving conditions for an ill-fitting backpack. 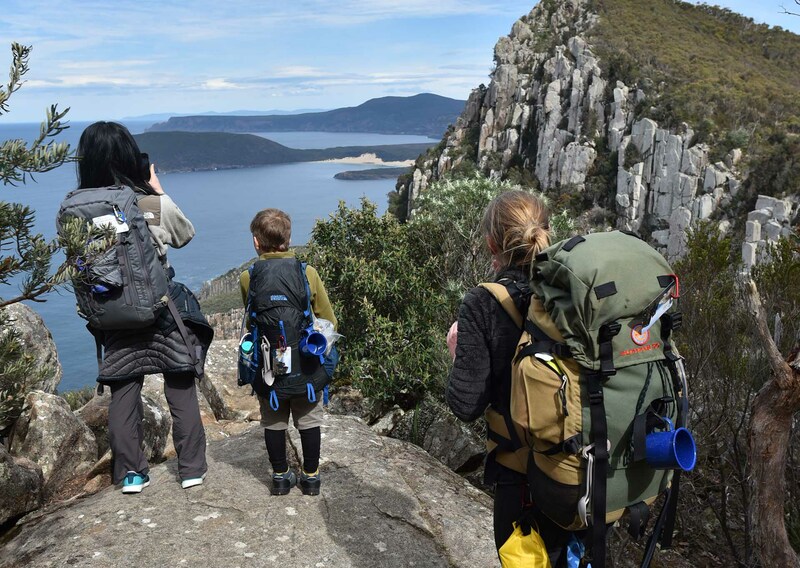 The tips outlined here apply across the board for most backpacks, but they take on greater importance when you’re carrying 20+ kgs over a 5-day hike! The most important measurement to find your backpack size is your torso length. This is measured from your C7 vertebra to your hip bone (your iliac crest). Too short a backpack and you’ll be putting too much weight on your shoulders. Too long and you’ll find it impeding with your stride over your backside. Ensure a snug tension on your shoulder straps; but not so tight that it numbs your fingers. Just snug enough that the main body of your pack is kept close to your spine. Remember, with most hiking packs, your hip belt will be doing a lot of the ‘heavy lifting’, not your shoulders. It’s the largest, most resilient of muscle groups, so it makes sense to use your core strength to drive most of the lifting. Make sure your pack’s hip belt is padded enough and sits at the top of your hip bone. Tensioned just right, it should take the majority of the pack’s heft. Generally speaking, the greater your pack’s capacity, the more padded the hip belt. Load lifter straps live between the top of your pack and your shoulder straps; these help to angle your pack so that it sits comfortably over your hips. If you feel your pack pulling you backwards, tighten them. Avoid overtightening as this may result in numbness of your shoulders and neck. As mentioned earlier, the closer the bulk stays to your spine, the better it is for stable carrying. Most hiking packs these days come with multiple compression straps that allow you to strap in your pack to stay as compact and close to your body as possible.